An old-school two-dimensional platformer, a tribute to the era of 8-bit computers and the first game consoles. Oniken is an old-school, two-dimensional platform game, using graphics from the times of 8-bit computers. The game developers, independent Brazilian studio JoyMasher, have done their best to pay tribute to classic productions from the time of the eight-bits and NES console. The action of the title takes place in the postapocalyptic future, when humanity was almost completely destroyed by global wars. 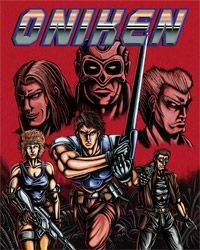 The few people who have survived are being oppressed by a cybernetic armada called Oniken. A small resistance movement, organized by General Zhukov, decided to oppose the enemy, but due to the incomparable numerical advantage of the opponent, the rebellion was quickly suppressed. However, a new hope comes at the moment when the legendary ninja Zaku, considered to be the only one who can oppose Oniken, joins the Zhukov movement. Oniken offers us six dangerous missions, played in three different sceneries. Individual stages are interwoven with a series of cut-scenes. During the game we will have to face both smaller opponents, as well as more demanding bosses and mini-bosses. The fight itself is played in the classic slasher formula, reminiscent of such titles as Strider or Ninja Gaiden. In terms of both graphics and sound, the game resembles productions from the ancient era of the first computers and consoles. According to the intention of the authors, two friends of Danilo Dias and Pedro Paiva, the game is supposed to be a tribute to classic productions for 8-bit platforms, on which a large number of today's players grew up. The only contemporary element, introduced by the creators to the formula of the game is the online scoreboard of individual players.